Gutters remain unnoticed by most people until leaks and other problems start happening; however, preventing costly repairs can be accomplished by simply cleaning gutters twice a year. Fall and spring are the best times to clean gutters. Leaves are notorious for blocking gutter spouts and preventing water from draining. The lush trees that surround certain residential communities in Lexington are beautiful to behold as the leaves change color in the fall but they could be a liability when winter comes if they remain in your gutters. An accumulation of slowly draining water can cause gutters to pull away and sag. Further damage occurs when the fascia continually gets exposed to water or when water starts seeping in your crawl space or basement compromising the integrity of your home’s foundation. Before all these costly problems happen as a result of a damaged gutter, it is imperative to fix a damaged gutter as soon as possible. A small hole can quickly double in size due to rust and corrosion. Gutter repairs range from patching holes, soldering leaky joints to re-attaching sagging gutters. Although some gutter repairs seem simple to fix, it is best to contact a professional roofer who can inspect and evaluate your gutters and provide recommendations that would prolong the life of your investment. Solation Roofing provides gutter repair and maintenance services in Lexington and its surrounding communities. The following are common gutter repairs that the highly skilled roofing experts at Solation can resolve for you. Re-hanging and replacing sagging gutters. Let Solation Roofing help you get out of the gutters. We are just a phone call away. 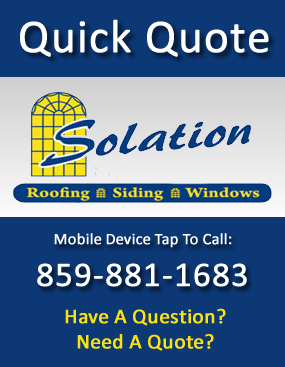 Call us at ……We’ll be glad to help you get your gutters back in shape so you can get the most life out of your gutters.